A great little solution for fixing Lawn Patches in one quick and easy formulation. The combination will help the seeds get of to a flying start. Enough for 50 patches of 30cm x 30cm. Supplied as 2.4kg Cut and Cover Patch Fix. A great little solution for fixing Lawn Patches in one quick and easy formulation. 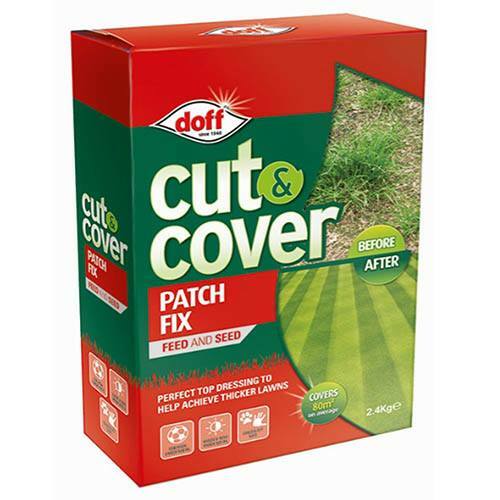 Whether patches caused by dogs, or damage through water-logging or heavy use, this magic little pack combines lawn seed, water retaining granules and fertiliser, to help the seeds get off to a flying start. Enough for 50 patches of 30cm x 30cm.